What is using all that memory on my Analysis server instance ? 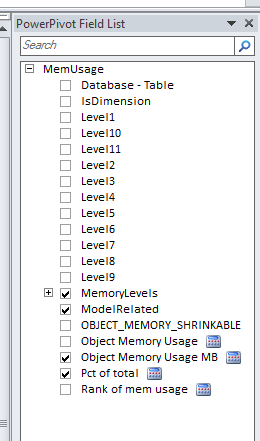 With the release of SQL Server 2012 tabular models identifying what the memory use of objects on your server instance is has become more important then ever. Since everything is in memory, being able to tune the model to remove columns that take up loads of memory could be very valuable. Or being able to use your development database to extrapolate the memory usage that you will have on you product machine. I have created a PowerPivot workbook that will allow you to investigate the memory usage on your server instance (this report could also be used on a MOLAP instance). The report contains two worksheets. 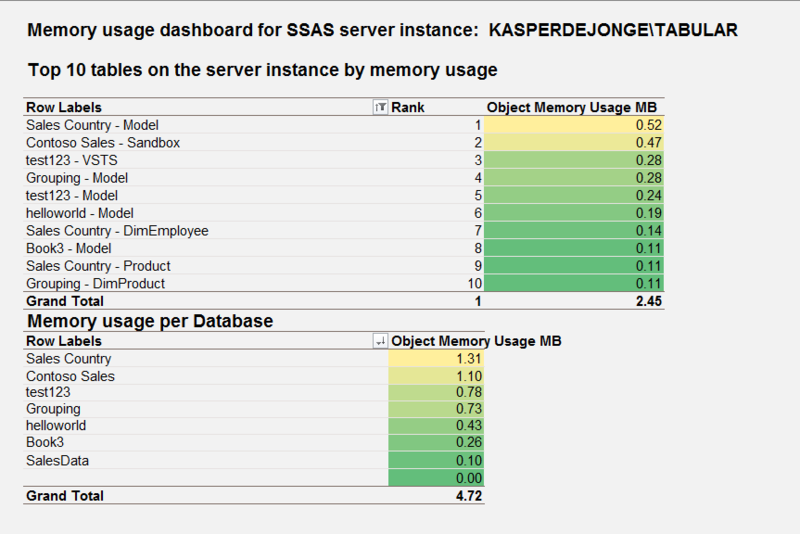 Worksheet 1 contains two dashboards, the first dashboard contains the top 10 tables on the server instance by memory usage. The second worksheet allows a more detailed investigation on all the objects on the server by using a pivottable. I have created a hierarchy of all the objects that allows to start at the top to bottom when you want to investigate the details. You can download the workbook and try for you self here BISMServerMemoryReport. Now also available is the Excel 2013 version here. 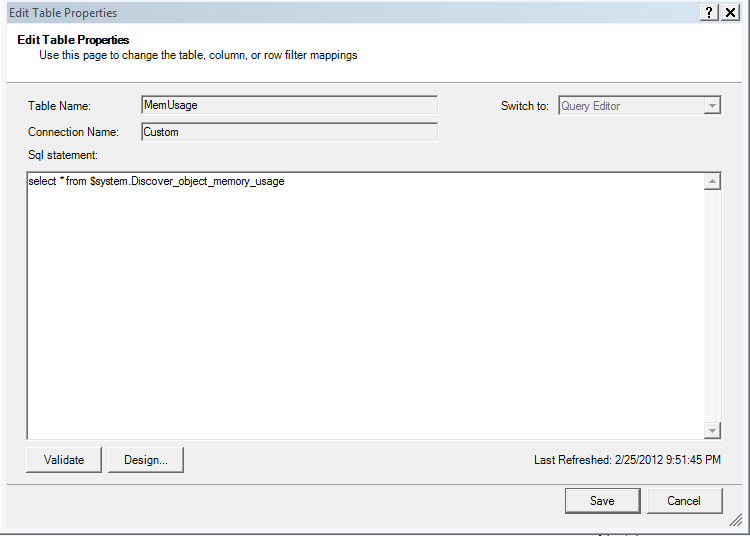 After this, refresh the table and refresh the data in the workbooks from Excel. Then the data that came in was manipulated by several DAX calculated columns using new SQL 2012 DAX functions like parent child functions and created hierarchies for them. I hope you can use this workbook, let me know if you have any comments or feedback on the report. I am always looking for new insights and ways to improve the workbook. Next PostSQL Server 2012 launched ! You have given me a bunch of homework assignments. Now I have to figure out why global allocators are eating 57% of my memory. Also I have to figure out why taskmgr reports that my instance is using 48 MB RAM but the DMVs for object memory usage are reporting only 15 MB used. 1) The memory report does not take the size of the Analysis Services executables into account (hence the memory size in the taskmanager is slightly lager). This is approx 150 MB. 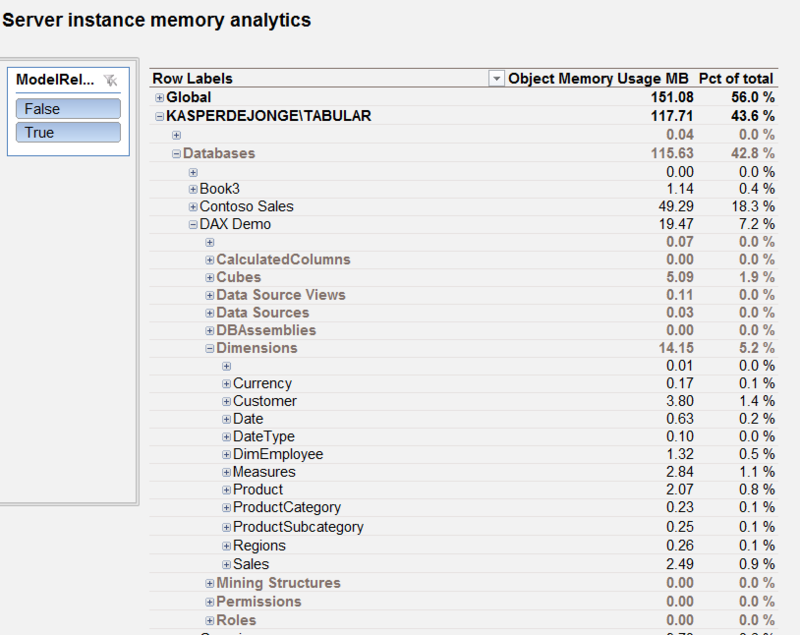 The global allocators are memory allocated objects that are not assigned directly to a model object. But there might be some objects that are related to the model that are not placed correctly. Unfortunately there are some issues with the object_memory_usage so this report will not give you a 100% accurate report of all your memory. It does give you an idea on the size of your objects and what is eating up most of the space. @Cathy Dumas are you looking at what counter in Task Manager? Performance Counters only reports private memory allocated by SSAS, the working set can be larger for many reasons, private virtual memory reported by Task Manager should be closer but still larger than memory reported by SSAS performance counters. Great difficulty in trying to download this….. I remember in the late 90s when I said its going to be so nice in the next century when it will be so easier to download things. NOT!!! What is the issue ? You should be able to open the link then do a save as to desktop. When I downloaded this all of the Level calculated columns are erroring out. Excel 2010 version. As a follow up. The errors in the Levelx calculations were due to the expression used for the RIGHT() function evaluating to a negative number in our environment. I added an IF statement to all of the Levelx calculated columns to catch those instances and the model started working perfectly. Thanks for the great tool Kasper! Kasper, I started using the spreadsheet this week and it is awesome. The only question I have is that the spreadsheet is consistently report 2x the size of what SSMS says the Tabular database size is. I have one database that is 515 MB and the spreadsheet analyzer says it is 1000 MB. Any ideas why this would be happening? Thanks, Mike. The memory reporting query is sometimes not as accurate as you want. Check the file sizes on disk for the most accurate numbers. do you have the SSRS (rdl) version of the solution ? Nope, but it shouldn’t be too hard to fix, just use the same DMV’s. Great post Kasper! Thanks for sharing! I receive errors after level 1. Any ideas? Any idea, what i should change? This is exactly what I was looking for, and then some. Great stuff! Thanks for sharing! This is what I was looking for. Great stuff!! 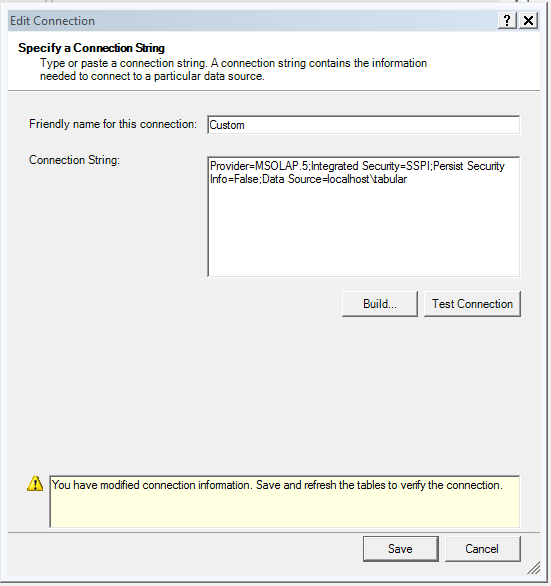 Will this work for Power-Pivot for SharePoint SSAS mode as well? Hi there, I downloaded your workbook and opened it in Excel 2016 and it complained with errors in the Level1-12 in the Power Pivot Model. I did hack a quick fix, but I do not think that it is 100% correct. I can email you the workbook if you would like to test and see what I did? Im using Excel 2016 and to remove error on level 2 and above i use syntax “=mid(PATHITEM([FullObjectPath];2;0);len(PATHITEM([FullObjectPath];1))+2;10000)”, changing in level 3 in first pathitem lvl to 3, second pathitem to lvl 2 and so on. How do I get access to the BISMServerMemoryReport? The link above does not work. I updated it, should work now. getting same error .. were you able to correct it ? Same Error here. I’m using Analysis Services Tabular 2017. I downloaded the workbook, but I get a warning claiming the PowerPivot model was created using a previous version of PowerPivot, so it needs to be upgraded. After the upgrade however, the model is corrupt and it cannot be opened. Hi, I have an Excel power pivot model that grabs data form multiple folders on our server, what do I change the localhost to when I edit the connection?